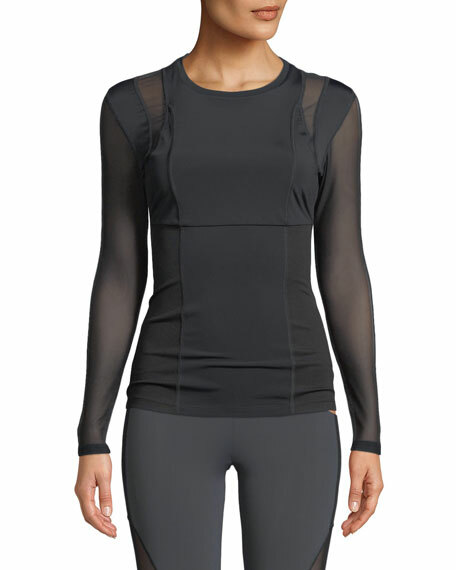 Cushnie Et Ochs "Veda" active top. For in-store inquiries, use sku #2422305. Iro "Adore" top in metallic stripes. V neckline. Long sleeves; bell cuffs. Dropped shoulders. Relaxed silhouette. Yoked back with shirring. Slipover style. Viscose/silk/metallic polyester. Imported. 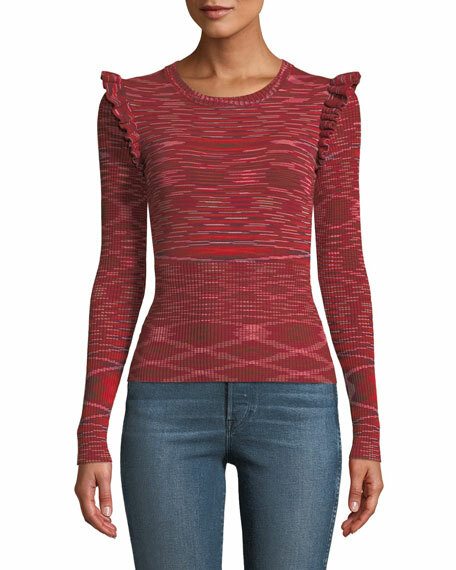 Rag & Bone "Clara" torqued knit top with ribbed back and textured sleeves. V neckline. Long sleeves. Relaxed silhouette. Straight hem. Pullover style. Rayon/polyester/spandex. Machine wash. Imported. Rag & Bone "Kento" knit top with contrast panels. Crew neckline. Long raglan sleeves. Relaxed silhouette. Ribbed hem. Pullover style. Pima cotton. Dry clean. Imported.